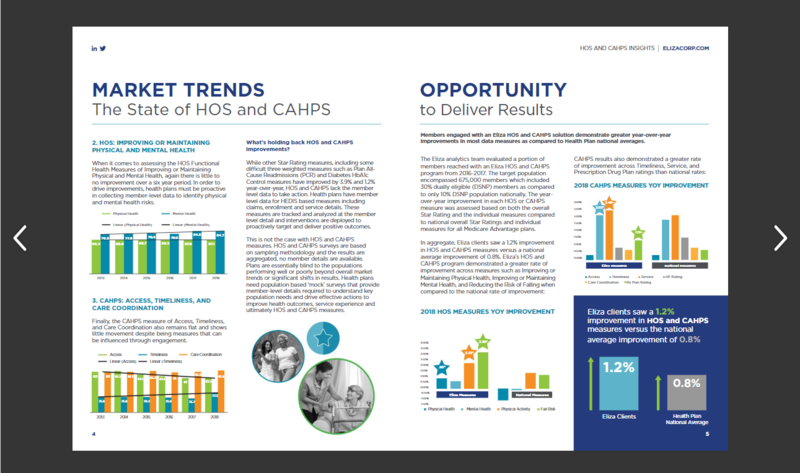 Together, HOS and CAHPS make up 27% of an overall health plan’s Star Ratings and 36% of Part C results. HOS and CAHPS results can make or break a Star Rating improvement strategy. Learn how HMS Eliza helped a client rapidly deploy a HOS and CAHPS program that resulted in the health plan improving four key measures by 1 and 2 Stars, and increasing the overall plan rating from 3.5 to 4 Stars. HMS Eliza can begin to help you intervene now to improve your HOS and CAHPS scores.